The Lake District National Park is regarded as England's finest area of scenic and natural beauty, with every opportunity available to enjoy it. In the town, you will find everything you need to enjoy your stay. There is a high standard of catering to suit all tastes and budgets, from take-aways for picnics or hot meals to gourmet restaurants with European and Asian cuisine. There are pubs and bars serving meals and excellent local brews, some lively with music, others for good crack with friendly locals. Shops include grocers, greengrocers and butchers, as well as art shops and gifts. Internet services are available at the public library and at the comprehensive Tourist Information Centre. Entertainment includes live music, four cinema screens plus occasional parades, concerts and traditional local sporting events. All sectors of the tourist market, from campers to gourmets, will find satisfactory establishments in Ambleside in which to stay, eat and drink. There are restaurants, cafés, coffee shops, pubs and take-away food shops to suit all tastes and pockets, including Asian and continental cuisine. Ambleside is a very convenient starting point for excursions, walking, cycling or driving, into all areas of the Lake District, situated as it is at the hub of the area's road system. The town centre is only a mile from the head of Lake Windermere, which offers a variety of water activities. Mainstream activities in the Lake District have an outdoor emphasis, combined with simple leisurely enjoyment of the magnificent scenery and its literary and artistic heritage. The area is justly famous as an escape for stressed out urban dwellers, who come to enjoy a little solitude as they walk the hills. Specialist shops in Ambleside offer a welcome variation on High Street chains, while galleries and small museums allow quiet contemplation. The area is equally famous for its high quality mountaineering opportunities, being the centre of English rock climbing and the country's most popular upland walking area. 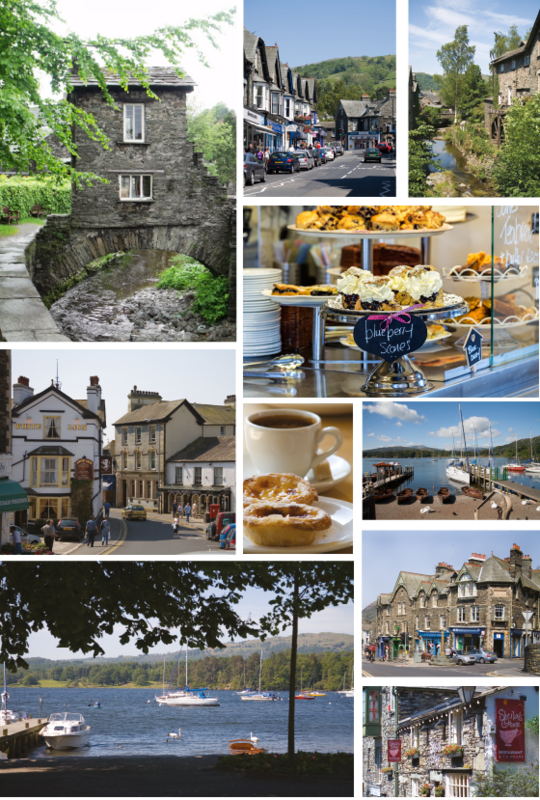 A good stay in Ambleside might include something of all these interests, combined with an occasional dinner in one of many high quality restaurants and a sampling of the vast selection of real ales available in the pubs. If the great outdoors is what you want, at local shops and info centres you can buy books and leaflets telling you how to get on to the fells (northern English hills/mountains). We will be happy to help you with local information on all aspects of your visit.